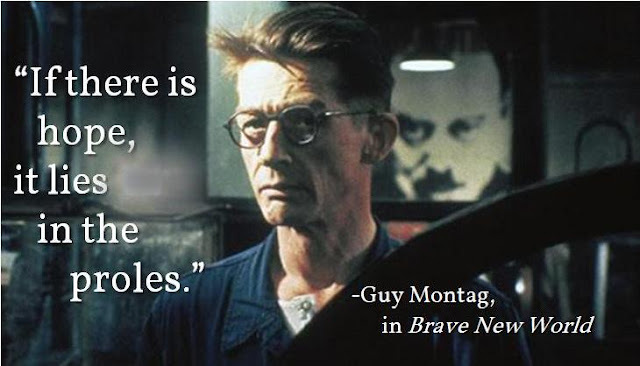 I see why it is nerd bait - the quote is from 1984, the picture is from the movie version of that book, Guy Montag is from Fahrenheit 451, and Brave New World is a different book all together. But if the Proles don't read enough to know these distinctions, there is probably not much hope of avoiding the dystopian futures these three books point to. I like the quote very much. We should never lose our hope. I am a writer in admission essay writing service, i would always tell to my students to never lose their hope. in life everything happens for a reason. there is a solution to solve all the problems in life.